Fortunately, you can make sure that your furnishings last by choosing your fabric carefully. Here’s what you need to know before you buy. 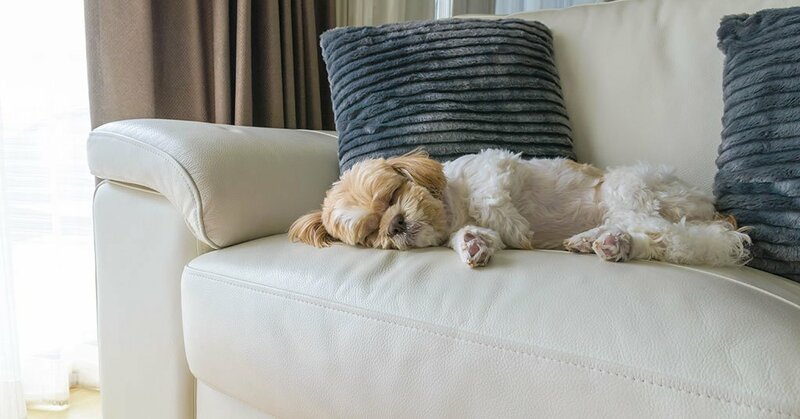 Whether you’re considering new furniture or reupholstering existing furniture, consider how your pets treat your current upholstery. If they don’t lie on your furniture, you can choose just about any fabric that you want. 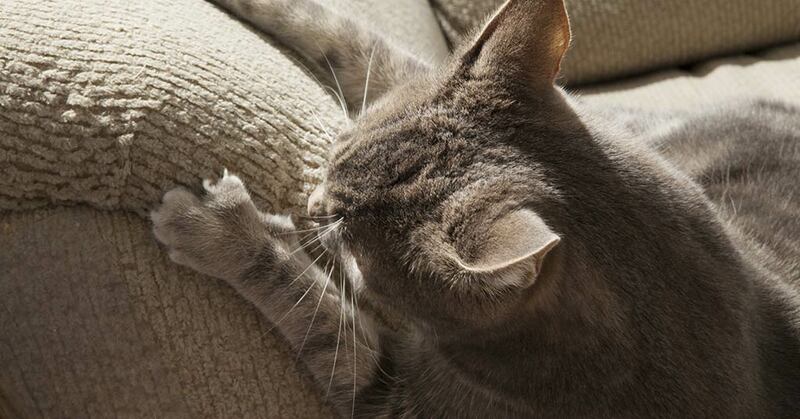 If they lie on the furniture but don’t scratch or claw it, avoid natural fibres such as cotton, wool or linen, as these easily show signs of wear. If your pets lie on your furniture, scratch, claw and/or chew it, forego fabric upholstery and choose leather or vinyl instead. A good rule of thumb when picking pet-friendly fabric is to choose a dark and/or patterned fabric, as this will disguise drool marks, paw prints, scratch marks and shed hair. It’s also a good idea to match the colour of the fabric to your pet’s coat to help hide hair between vacuuming. Although synthetic fibres may not be your first choice aesthetically, they are as close to pet-proof as you’re going to get. This is because synthetic fabrics are more durable than natural fabrics, don’t show scratch marks easily, and can usually be cleaned with a solution of soap and water. For added protection, have your upholstery Scotchgarded – if possible – or use slipcovers, throws, or blankets. Make sure that you go for an evenly-textured fabric with a tight weave, which will be more durable and less likely to trap pet hair than a heavily textured fabric with a larger weave. Other advantages of a tight weave fabric are that scratch marks can be buffed out of it fairly easily, and spills will bead on the surface – giving you time to catch them before they are absorbed. When shopping for fabric, always check the cleaning code. S is for solvent or dry cleaning; W is for water-based cleaning; S-W means the fabric can be either dry or wet cleaned; and X means the fabric can only be vacuumed. Pet owners should always go for fabrics in the W category. Microfibre is a synthetic fabric that can mimic the appearance of silk or suede, but is more durable and fairly stain-resistant. Microfibre fabrics are also a good choice for households with pets because they have an extremely tight weave, so they don’t trap pet hair and dander easily. The only downside is that microfibre is commonly made from polyester or nylon, and, as these fibres are synthesised from petroleum, oil-based stains can be hard to remove. Acrylic fabric is a popular choice for both indoor and outdoor furniture because it is resistant to moisture and dirt, is easy to clean and is fairly inexpensive. Choose a higher quality acrylic fabric, as this will withstand abrasion better than a cheaper textile. Wool is a good choice for pet owners because it is durable and resists pilling. However, it does absorb stains more easily than synthetic fabrics, can be difficult to clean, and is prone to shrinkage. If you are set on wool, look for a wool blend, which will be softer to the touch and easier to clean than pure wool. Leather is another good choice for pet owners as it doesn’t attract pet hair, resists stains, doesn’t trap odours, and is tough and durable. However, if your pets are prone to scratching furniture, consider purchasing distressed leather to disguise scratch marks. One downside of leather is that it can be punctured by a pet’s claws, which may cause large rips and tears over time. Although leather is easy to vacuum and can be cleaned with a damp cloth and/or leather conditioner and saddle soap, not taking proper care will lead to scuffs and cracks. So if you decide that leather is right for you, choose Semi-Aniline leather, which has been treated with a protective surface finish to increase its durability. Vinyl is a synthetic plastic with a similar look and feel to leather. Vinyl is resistant to moisture and humidity, fairly strong and durable, and easier to maintain than leather. However, although you can save money by choosing vinyl over leather, it is less durable, more vulnerable to claw puncture marks, and more prone to scuffing and cracking than leather. Crypton Super Fabrics are a popular choice in hotels, restaurants and hospitals because they are engineered to be water-repellent and stain-resistant, and don’t trap odours. Crypton is also tightly woven, so it doesn’t trap animal hair and dander, and can withstand clawing and scratching. Many people choose chenille for their upholstery because of its texture and softness. However, while chenille is durable, it is not a pet-friendly fabric because its pile is made of many tiny loops that can easily be destroyed by animal claws. It is also easily soiled, and often impossible to repair. Linen is available in both tight and loose weaves. While tight-knit linen is highly resistant to pilling, it doesn’t withstand heavy wear well and shows dirt easily. Linen is also prone to shrinkage, making it a challenge to clean. While pet hair will slip off of silk and silk fabric blends, it is one of the worst choices for pet owners as it absorbs moisture, stains, snags and rips easily. It is also hard to clean. Olefin is another fabric synthesised from petroleum. So while it is resistant to moisture and stains, it does attract oils. Olefin is also easily damaged by friction, so this is a fabric that should be avoided. Rayon is an affordable synthetic material that resists fading and mildew. However, it isn’t suitable for pet owners as it wears easily, absorbs moisture, loses strength when wet, and is prone to wrinkling and shrinkage. Acetate is another synthetic silk imitation. While resistant to pilling, shrinkage and mildew, acetate isn’t dirt-resistant, wears easily and tends to wrinkle. Cotton is a flat weave fabric, so it withstands clawing better than some fabrics. 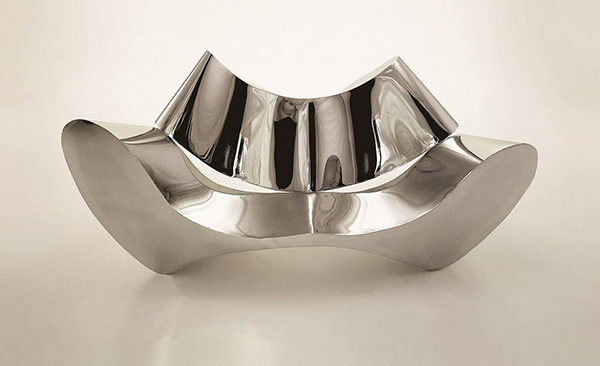 While it is easy to clean, it however absorbs liquid quickly, tends to wrinkle and is quite fragile. 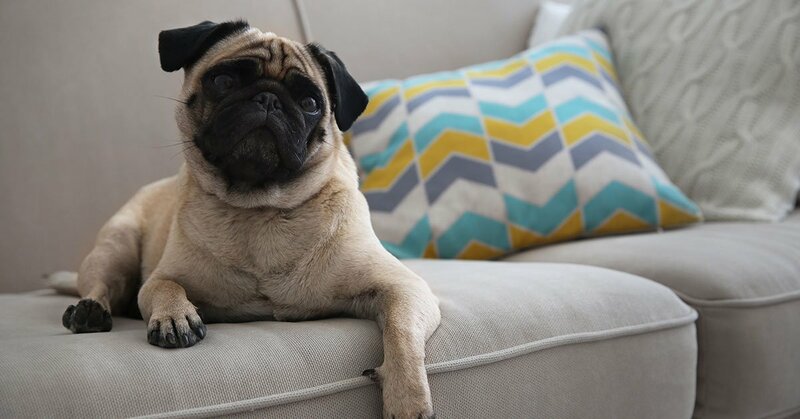 While velvet has a soft and strong pile and can hide dirt well (if you choose a dark colour), it stains very easily, attracts pet hair and can be crushed by excessive activity. Tweed may camouflage pet hair but it also traps hairs in its fibres, making them hard to remove. Tweed is easy to clean, but any damage is likely to be impossible to repair. 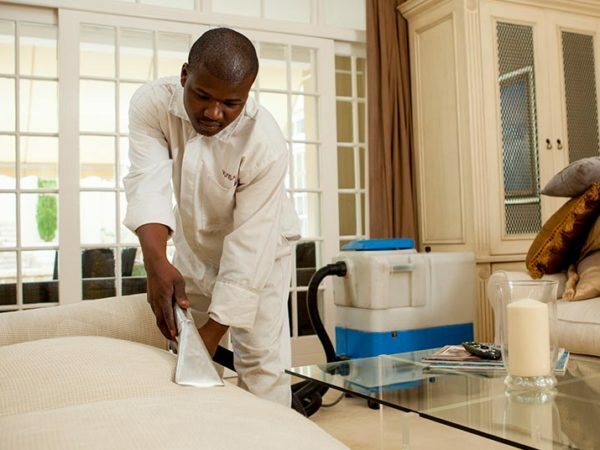 No matter which fabric you choose for your upholstery, make sure that it looks good for as long as possible by having it professionally deep-cleaned, once or twice a year and whenever it needs sprucing up. 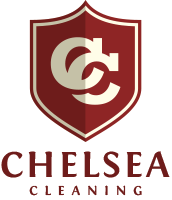 At Chelsea Cleaning, we offer expert deep cleaning of upholstery that can bring your furniture back to life. 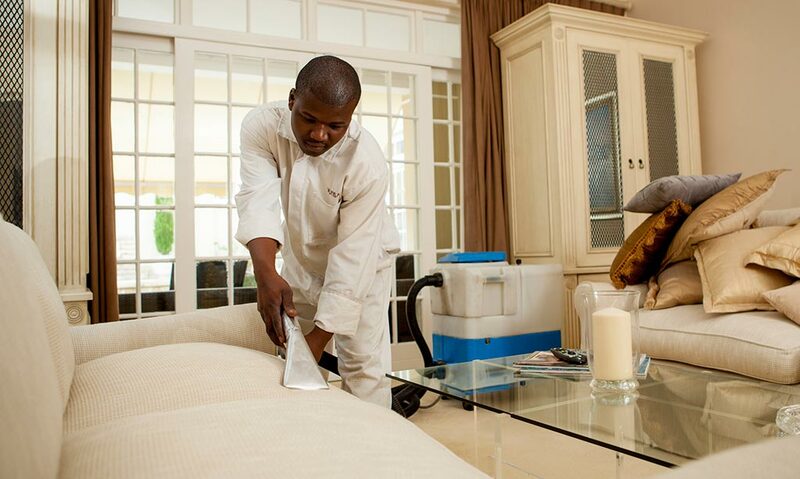 Our team can also help prevent future staining and soiling by applying blockout fabric protector to your upholstery. Contact us for more information or a quote.